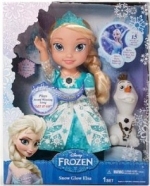 The Snow Glow Elsa Doll allows you to experience the magical blockbuster Frozen movie again in the comfort of your own home. Just raise her arm and hear her sing the "Let it Go" song whilst her snowflake necklace lights up and her dress lights flash to the beat. 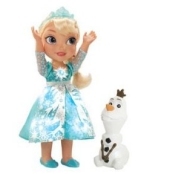 Elsa will talk with 15 familiar phrases including "I can do snow magic, wanna see? ", "Do you wanna build a snowman?" and "I'm Princess Elsa of Arendelle". Also included is the character Olaf.